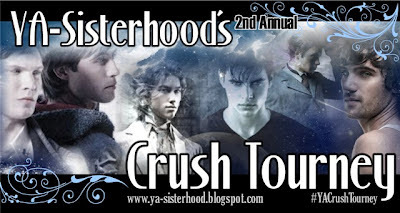 So, the time has come for the second YA crush tournament, hosted by YA Sisterhood. I looove me some hawt boyz, especially if they're from YA. Anyway, right now is nomination time, when us fabulous YA lovers get to vote for which guys we want in the competition. As of right now, a large portion of the nominations go to Cassandra Clare's books. If you follow this blog, you should know that I adore Cassie. The Mortal Instruments and Infernal Devices are two of my favorite series, so I'm not upset that so many of her delicious guys have been nominated, but the world of YA is an enormous one and there are so many other fabulous guys that tend to be overlooked. This year I tried to nominate boys I felt definitely deserve to be in the tournament but aren't as extremely popular as Cassandra Clare's guys. I did pick a few popular guys that I just couldn't pass up, though. Here were my ten picks. So please, if you haven't nominated yet, consider those lovelies above. What do you think about my choices? Who did you (are going to) pick? And yes, I linked every time I said "nominate" or some version of that word to the nomination page because I really want you to nominate cute guys. Especially the ones I nominated. I absolutely love Adrian Ivashkov! So I will have to nominate him among your selection. Also, what about Graham and Reid from Tammara Webber's Between The Lines? I nominated Tod from the Soul Screamers books before I accidentally hit enter and submitted my form. At least the one I managed to submit was a good one.